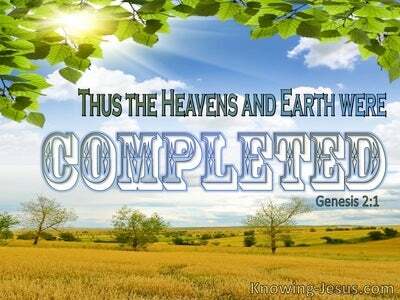 What Does Jeremiah 18:4 Mean? 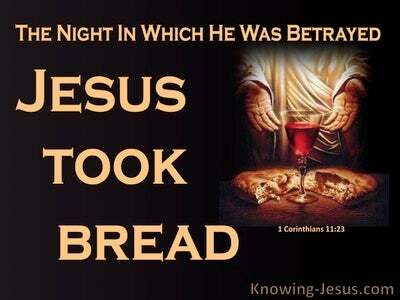 We are like that clay that has been taken up by our heavenly Potter to be fashioned and formed as He thinks best. The daily round of life and the common tasks we face seem to go around in circles, and the fires of affliction and pressures of life at times seem hard to bear. But we are His children. 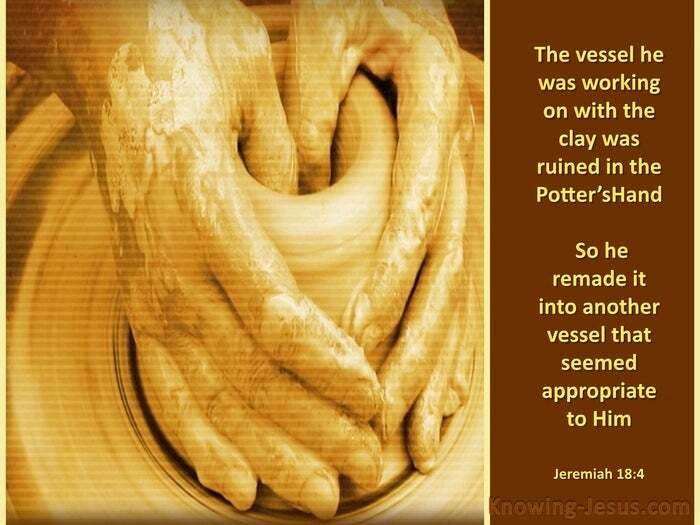 We are the clay in the hands of our Father, Who is shaping, moulding, forming and completing us into the person He wants us to be – a vessel fit for His use. Sometimes we think we should be up and doing for the Lord, if we are to become a useful vessel for Him. 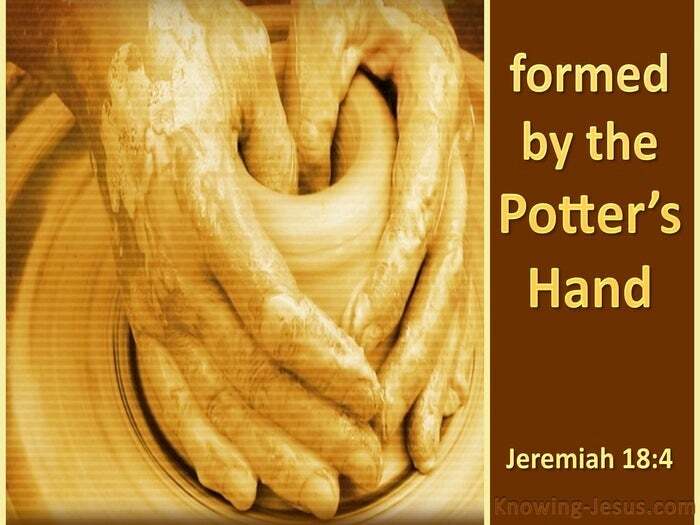 But the picture of the potter demonstrates that the vessel that stays patiently in the hands of our heavenly Potter, as He carries out His best purpose in our lives, is the one that will be formed and fashioned as is best for us. 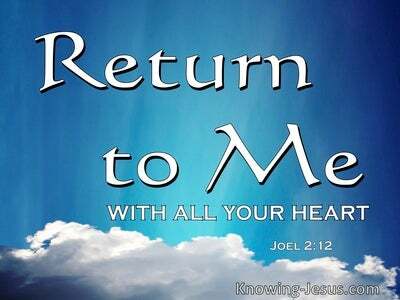 Let us trust ourselves into the hands of our heavenly Potters hands for they were wounded for us. He will shape us and mould us and fashion us and form us into the vessel that is best pleasing to Him. But sometimes, as He turns us on the rotating wheel of life – we become dissatisfied with His training. Sometime as He squeezes us into the shape of His choice, it can become so uncomfortable. 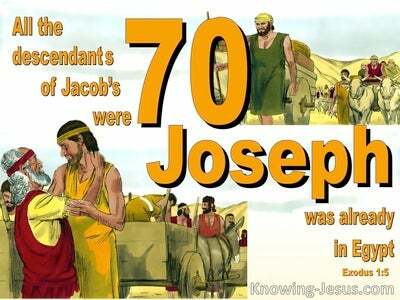 Sometimes as we are being baked in the fiery kiln of life - the pressures we face become unbearable – When this happens just remember that the trial of your faith, being much more precious than of gold that perishes, though it be tried with fire, might be found unto praise and honour and glory at the appearing of Jesus Christ. Loving Father, thank You for the truths in Your word. Thank You that You are forming me into the person You want me to be. Help me to lie willingly in Your hands, for I trust You to form me into the vessel that You want me to be, to Your praise and glory, AMEN.